Manufacturing facilities, factories, and plants are busy – people are moving around quickly, machinery is humming, and potential hazards lurk around every corner. Ceiling signs can help processes run efficiently and keep workers safe. Because so many people learn visually, signs placed strategically throughout your facility can impact how efficiently employees work. Signs can also positively impact safety. And in some cases, signs are required by law. The Occupational Safety and Health Administration, in CF 1910.145 requires many manufacturing facilities to display prominent signs where hazards exist. As you can imagine, OSHA is very specific about safety awareness, hazard warnings, and numerous other notifications. Utilizing a banner hanging system allows you to hang custom signage throughout the workplace, whether you’re providing directional assistance, identifying work and hazard areas, or reminding workers to use safety equipment. 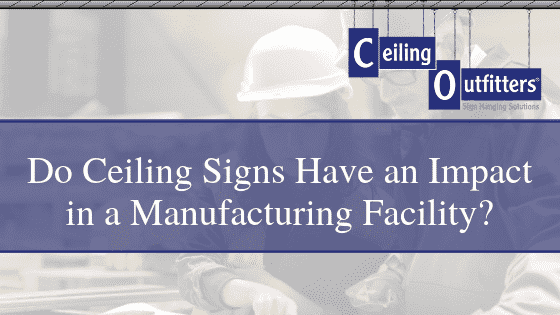 What Kind of Impact Can Ceiling Signs Have in a Manufacturing Facility? Ceiling signs get your message across in a clear, organized manner. You control the placement and eliminate the chance of an important sign being accidentally moved. The flexibility of ceiling sign placement, when utilizing a sign hanging system, allows you to tailor the messaging delivery. With proper signage placement, you can increase productivity and safety awareness, impact employee morale and involvement, and streamline workflow. Clear communication of procedures and pathways eliminates delays and congestion. The old adage ‘everything has a place and everything in its place’ can have a major impact on your manufacturing facility. Ceiling signage can direct everyone for faster, more efficient workflow. Proper signage can be used to warn employees of hazardous conditions, alert visitors to potential dangers, and create awareness to reduce accidents. And, with a signage hanging system that uses magnets, versus static hardware, you can immediately adapt your messaging placement. The workplace can become repetitive and messages lose their impact when they are stationary, over time. Creating signage that is message specific, with impactful colors, and flexible placement encourages employees to stay engaged. Using a ceiling signage system will allow you to quickly and safely change out signage to keep your messaging new and fresh. Ceiling signage can help you streamline your facility. Shipping and receiving are best separated to avoid congestion at the loading dock areas in the building. Prominent ceiling signage optimizes the areas that matter the most. In finished goods holding areas, you can segment the space and identify that lane with a hanging sign that is easily changed when the product is changed. Ceiling signage utilized in manufacturing facilities and plants is a very effective method of communicating without losing valuable floor space. 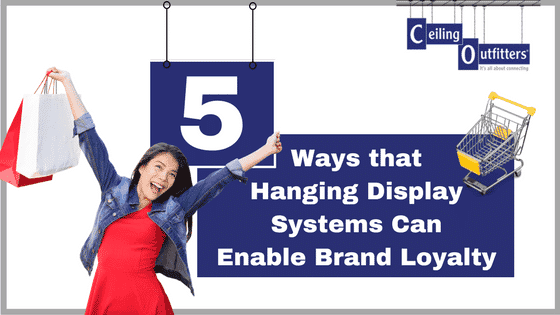 Implementing an overhead visual messaging system can increase productivity and efficiency. 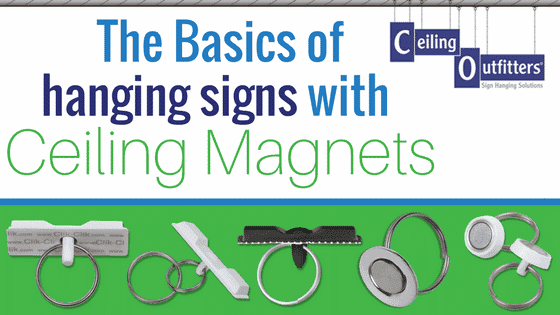 The most efficient overhead messaging tools for today’s workplace include magnetic sign hanging systems and banner hangers. Magnetic sign hanging systems are designed to create a highly visual workplace without compromising safety during installation. The Clik-Clik Magnetic Sign Hanging System provides a safe, quick and easy method for hanging signs up to 27 feet without your feet ever leaving the ground. It also reduces installation time by up to 70%, making it incredibly efficient as well as effective. Value priced starter kits are available to minimize the investment in overhead communication. 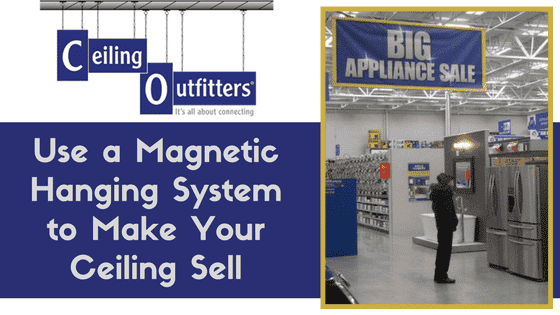 The magnetic system allows for low ceilings, tall ceilings, and extra-tall ceilings. Banner hangers, such as the E-Z Aluminum Banner Hanger and E-Z Plastic Banner Hangers are an economical way to visually communicate your message in an office or meeting room environment. These banner hangers will stabilize the top and bottom edges of signs which prevents edge curling making your message more visible and readable when communicating with employees. 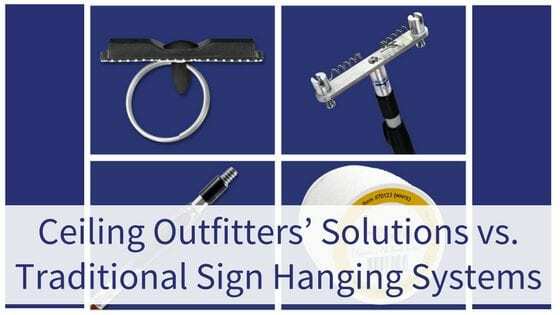 Although OSHA outlines specific communication requirements for signs, and the American National Standards Institute outlines design requirements, neither organization provides ceiling sign hanging solutions for your manufacturing facility –but Ceiling Outfitters does! Our sign hanging systems can make your workplace safer, more efficient and ultimately, more productive.